Measure and keep all the ingredients ready. Also preheat the oven to 180 deg C for 10 minutes. Take whole wheat flour, semolina/suji, baking powder(optional) and cardamom powder in a sieve. Sieve it together and keep aside. Take the ghee in a mixing bowl. Add brown sugar and milk to it. Mix well until the sugar is completely melted. Then add the sieved semolina whole wheat flour (dry ingredients) to the ghee sugar mix (wet ingredients). Start kneading the dough with your hands gently and continue kneading until you get the non sticky dough consistency. Now take the cookie dough, start making balls and flatten it using your palms. Then line the cookie tray with a cookie sheet/parchment paper. 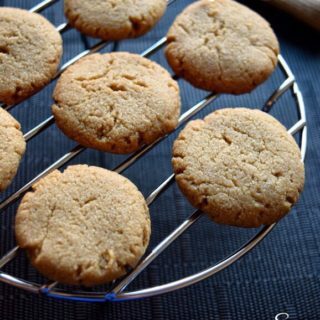 Arrange the cookies in parchment paper, bake in the preheated oven for 15 -20 minutes (baking time depends on the size of the cookies and oven) at 180° C till cookies are browned at the bottom. Allow to cool in tray completely and serve the cookies.